The 7700 ION 3-phase power meter, analyzer, and controller is used for transmission and distribution, energy service company (ESCO), and power marketing applications. The meter features an internal modem, which allows an efficient and cost-effective means to communicate with critical circuits at remote substations and customer sites. The option eliminates the need to buy and install an external modem and converter for each meter. The modem feature allows multiple meters to share one meter's modem, saving on wiring, installation, and equipment costs. Up to 31 additional meters can be daisy chained on a loop from the first meter. It supports several protocols, providing seamless connection to power monitoring and control software, or other energy management and automation systems. The modem operates at up to 33.6 kbps with a fast connect time. It is compliant with FCC and DOC standards, and the modem's design and optical isolation assure failsafe operation. Users have a choice of connecting to the telephone network via a standard RJ11 connector socket or a captured-wire connector for superior electrical contact and greater durability. The revenue-class meter features advanced power quality analysis, on-board trend and event recording, load profiling, expandable I/O, and setpoint alarming. In addition, the device offers multiport/multiprotocol communications, including Ethernet TCP/IP and three serial ports that provide a combination of RS-232 and RS-485 interfaces. 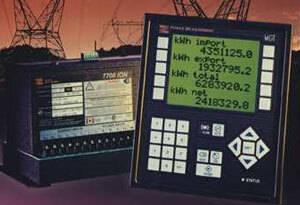 The meter gives users a single, integrated system that can adapt to evolving metering and information requirements. Power Measurement Ltd., 2195 Keating Cross Road, Saanichton, BC, Canada V8M 2A5. Tel: 250-652-7100; Fax: 1-250-652-0411.